Mike Vick had a big day yesterday. Ironically it came on the same day that his predecessor in Philly (and that evening's opponent), Donovan McNabb, got a new $78 million deal. Vick passed for 333 yards and 4 TDs while also running for 80 yards and 2 TDs. He was the first player in NFL history to have a game with 300+ passing yards, 4+ passing TDs, 50+ rushing yards, and 2+ rushing TDs. Yeah, pretty good day as the Eagles hung 59 points on division rival Redskins. Every sportswriter in the country is expounding about "possibly one of the best games a QB has ever had" but it seems to me that every story has a "what happens next" element to it. Although maybe that's just my inner Eagles fan reading too much into these articles. Either way, let's discuss. Or rather, I'll just write what I think and you can accept every word. The Eagles will get a new contract worked out for Vick. Whether that happens during the season or after the season nobody knows. 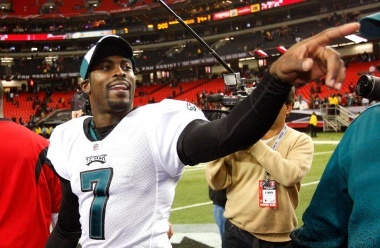 It would be better for the Eagles to do it sooner and it would be better for Vick to do it closer to free agency. Keep in mind that if negotiations do fall through the Eagles will have the final trump card in this case with the option of placing the franchise tag on him. Although that is clearly the worst case scenario. Vick has already said that he'd like to continue playing for the team that gave him his first opportunity after his incarceration and will give them every chance to sign him long term. The other question that this brings up is, what about Kolb? Do the Eagles keep Vick AND Kolb or do they trade him for like 85 1st rd picks and a few Pro Bowl CBs and DEs? According to Chris Mortensen on ESPN this morning, they can actually keep both of them. Apparently the contract extension Kolb received this Summer was really more of a roster bonus with another 2 years tacked onto his existing deal. Mort said that Kolb is only scheduled to receive about $1.8 million next year. Which in my opinion is a pretty easy to swallow contract for a team's backup QB. However, as we all know the Eagles are a team that likes to exploit values which means that they'll be tempted to trade him to someone looking for a real franchise QB. Maybe Minnesota, Miami, KC, or Arizona. Shoot after last night it looks like Washington might be looking for a new QB. This might be a bold prediction considering all the "Where will Kolb end up speculation" going on today, but I think the Eagles will keep him on as the backup. The aggressive play that makes Vick such a dangerous weapon, also makes him very injury prone as we've seen already this year. If the Eagles keep Vick they'll need a highly capable backup and as Andy Reid has said over and over again this year, he is very happy having two very good Quarterbacks on his roster.